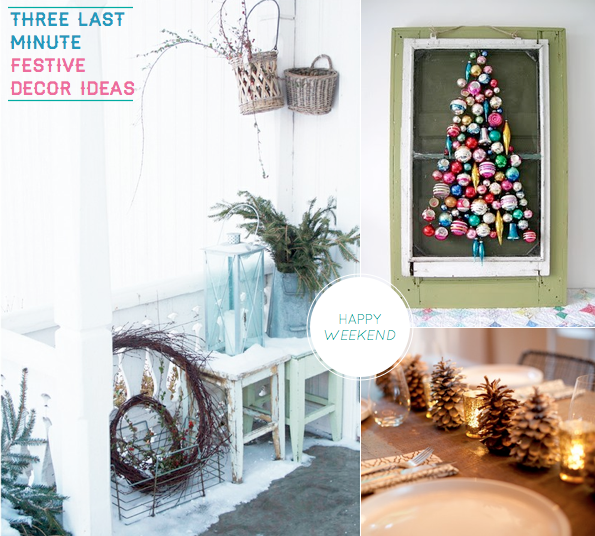 Bright.Bazaar: Happy Weekend: 3 Last Minute Decor Ideas! great ideas! have a great weekend! I'm doing crafting this weekend, once i finally finish my Christmas shopping! I'm making 2 table centrepieces! I'm going to post them on my blog on Sunday hopefully so take a look! perfect ideas, effortless and chic! Yes, sometimes the simple decorating is classic. Love the pics you have shown. Do you ever relax? Sounds like you are very relaxed at 5am. ;-) Aren't we all. Happy holidays! Love the bauble tree! I have been pretty lazy with my decor so far...I might have to try the tree! Time is flying, and I have a lot to do before Christmas too. If I'm not getting a real tree this year I will form my baubles like a tree I think, love that idea! I will try to figure out a way to put them together without glue, so I can use them in my tree next time I get one. I thought I was so on top of things then I realised a batch of cards not written and presents to wrap. all now done. Christmas eve I'll make up two more wreaths and ice my two christmas cakes.... but till then Stockholm here I come. How cute!! It's amazing what can be achieved with glue gun and a little imagination isn't it..?